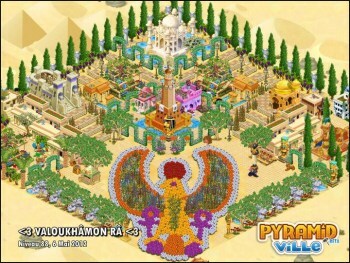 Zynga has filed a trademark infringement complaint against the French publisher of PyramidVille. You would be forgiven for thinking that PyramidVille, a new Facebook game currently in beta, is a Zynga joint. It doesn't just have the distinctive "Ville" in its title, it very much looks the part, too. But it's actually being developed by French company Kobojo, and that has inevitably led to a dispute with the folks from FarmVille. Zynga filed a trademark infringement complaint against Kobojo last week, claiming that "Facebook users are likely to believe, erroneously, that PyramidVille is a member of Zynga's 'Ville Family of Games." Interestingly, Zynga doesn't actually hold a trademark on "Ville," although it has applied for one [the application process was suspended by the U.S. Patent and Trademark Office earlier this month], but the company claimed in the suit that it has "consistently promoted the 'Ville Family of Games together as a family, identified by the distinctive 'Ville suffix." Kobojo was asked by Zynga to change the name of its game but refused, perhaps emboldened by the refusal of the makers of Dungeonville and Blingville to give up their names as well. Both of those companies have filed their own preemptive lawsuits seeking rulings that their games do not infringe upon Zynga's trademark; a settlement in the Dungeonville case was reached in March. Zynga is now seeking triple the profits Kobojo earns from PyramidVille in damages. A "case management conference" between the two companies is currently scheduled for July 24.